Done in blinding Fuschia Cascade fixation. They took very little time and are perfect for the summer. 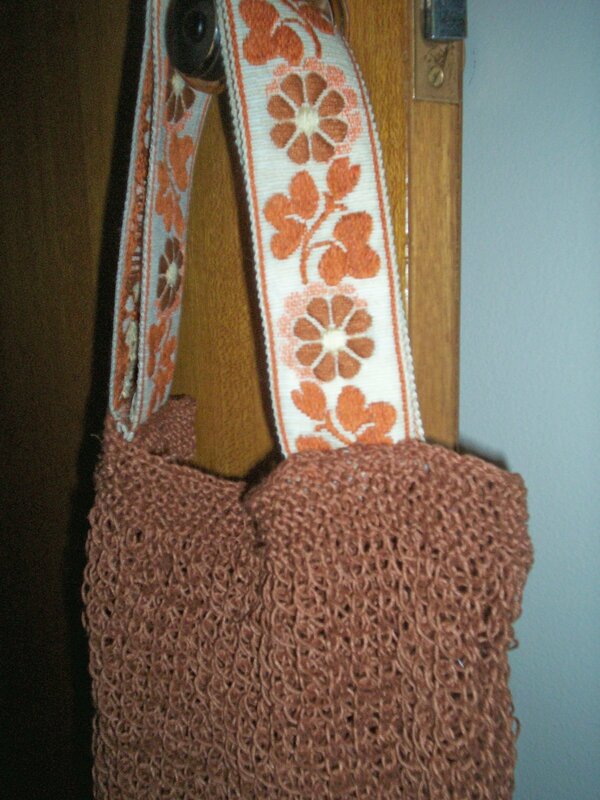 When I first saw the pattern for the bagstopper, well I was intrigued. I didn’t particularly like the whole “ribbon” idea (it seemed a bit unfinished to me) but I really like market bags, reusable bags and basically bags in general. I was swayed by the airy feeling the bag had and the hemp-yness of it all. I love hemp, I love the fact that it holds up well, that it’s eco friendly, I just love the stuff. 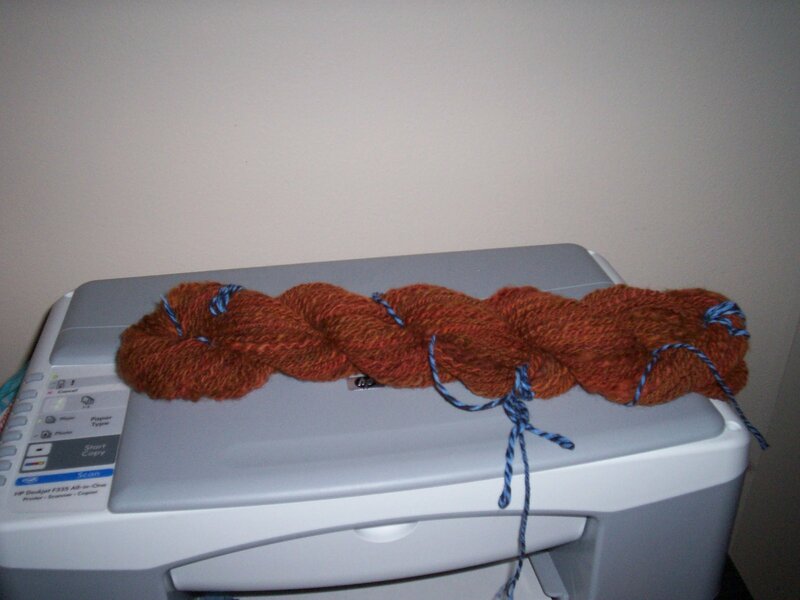 So Lana and I were picking up the yarn for her very own Clapotis and I saw that there were two skeins of allhemp in the most lovely color (cinnamon) that would go perfectly with some vintage “ribbon” I found thriftstore shopping (the best 75 cents ever). 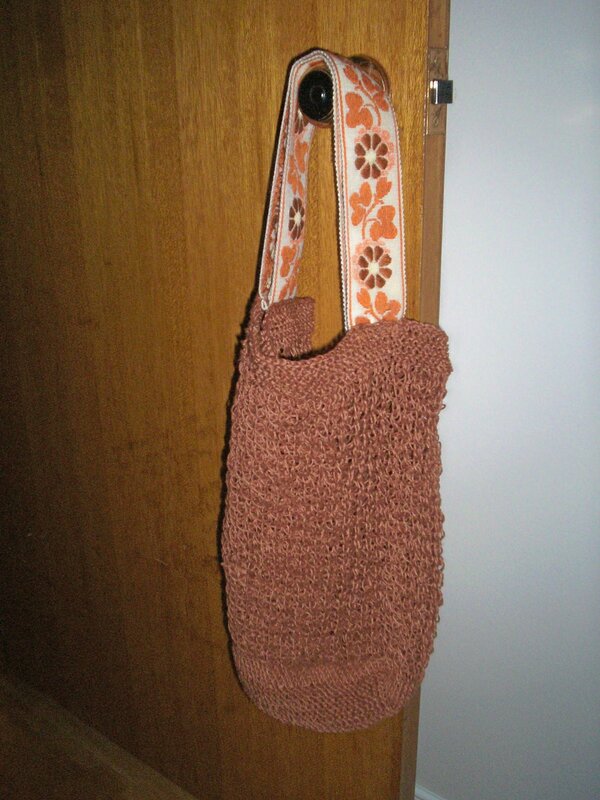 I immidiatly got the allhemp and last night set to work making the bag. Since I’ve been on somewhat of a yarn diet (attempting where at all possible to knit from stash rather than from bought things) I’ve been finding patterns I love to knit moer than once, and clearly EZ’s baby suprize jacket is one of them. 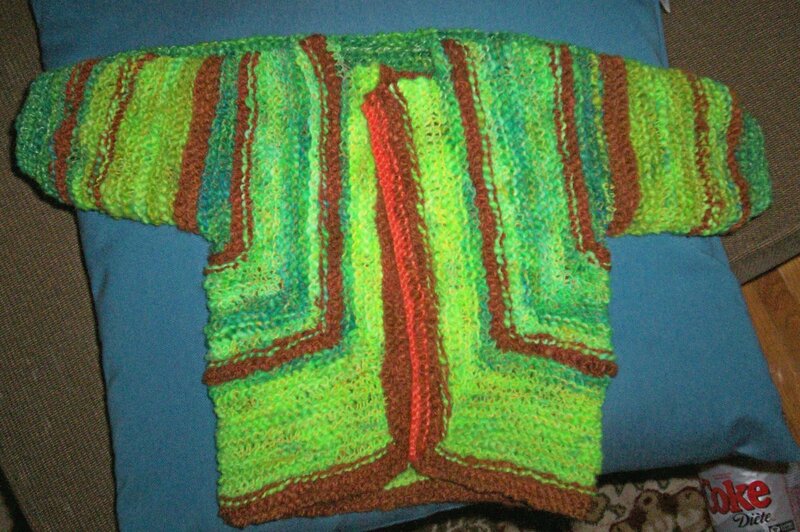 So I took some yarn I spun and plied (the green with thread and the brown is my first two ply experiance) and made yet another surpize jacket. The good thing about this is should anyone have a baby in my vicinity I shall be ready. Then I had some left over butterfly super 10 from makeing a Henry Rollins doll and because well white/creme/offwhite etc and I don’t get along even slightly I died it a kind of poppy red and pink (or what was left of it). I do fully intent to knit this up with black accents into more than likely a babyjacket. That and the fact that there’s another baby coming into the family I really want to have some nice stuff to choose from to give to her. 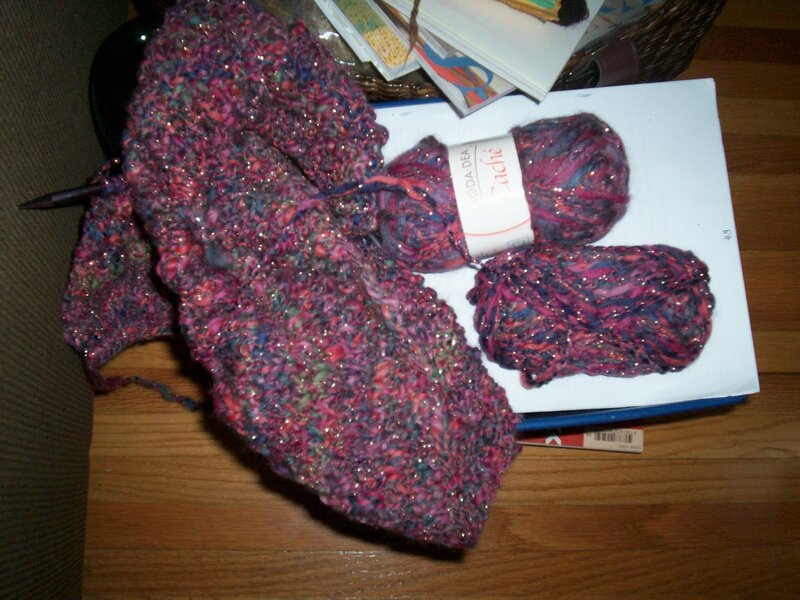 Lana is starting her very own clapotis which will be more than cool when it’s done. She’s just finished blocking Magknits Durrow, which she intends to give to her man Adam for his birthday. It looks great (and helped me de-stash at the same time). Yay! 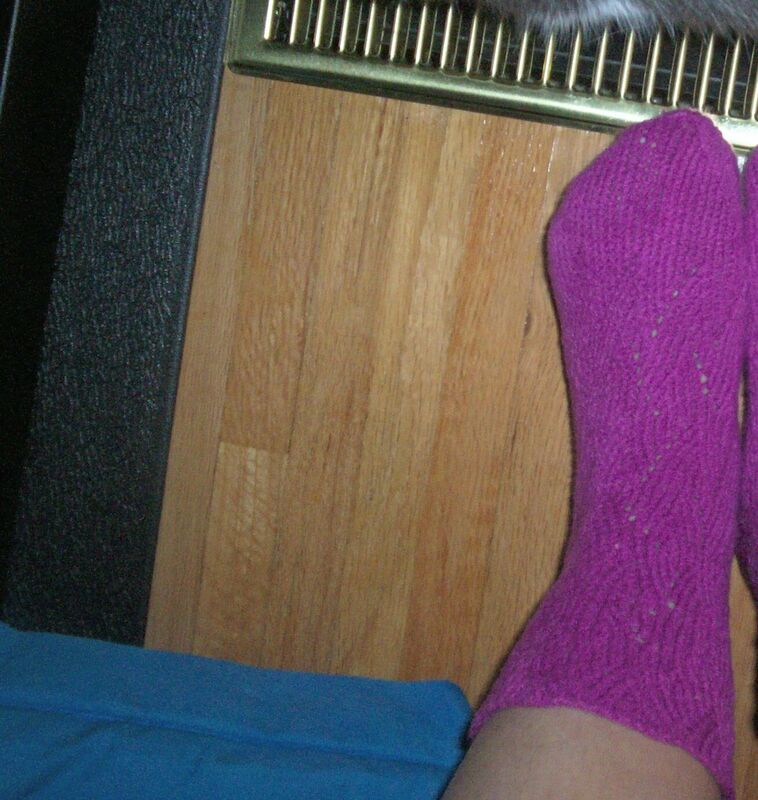 Anywho I should go clean the house and possibly start knitting something else. Or not start knitting something else and finish the siewash. The only thing is knitting with icelandic wool in the heat seems obscene and I need mentally easy things to tackle until I’m done babysitting Joesphine. 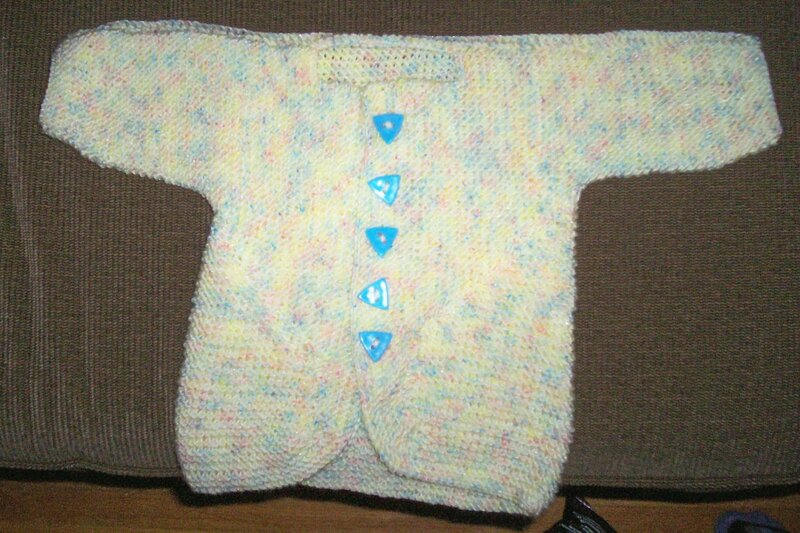 Okay so I finished the suprize jacket, it turned out great, and since I now know it’s going to be a boy I added some cute blue buttons. 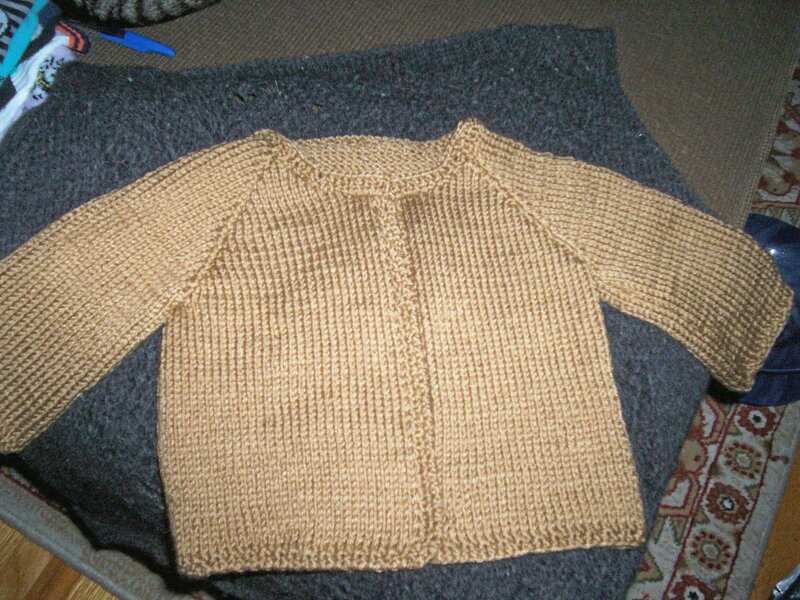 I also found a Stephanie Pearl-McPhee baby jacket pattern on Knitty which I made in brown, all the ends are sewn in and everything it just needs buttons, but I try to wait to put buttons on until I know if its a boy or a girl etc. 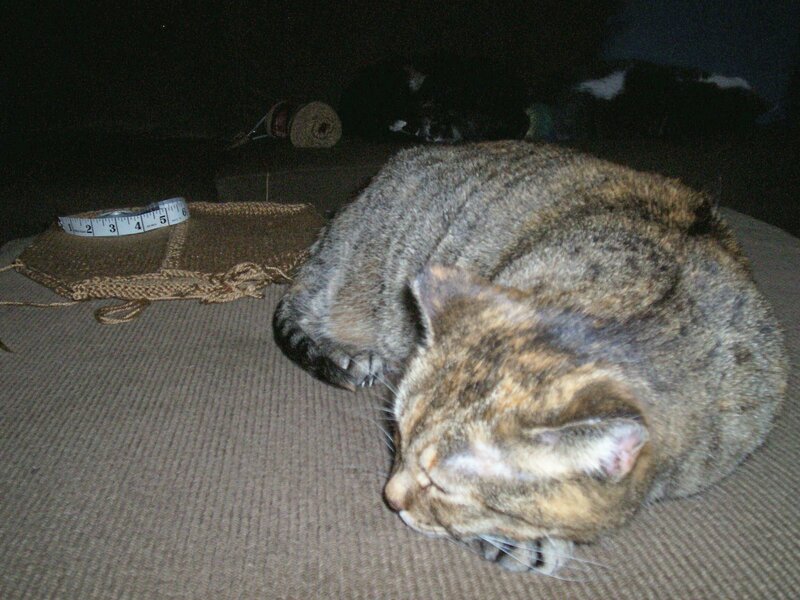 I’m also throwing in a shot of Peatrie guarding my knitting as she tends to do. Shes like a magnet to wherever a project is, she never sleeps on it though, just hovers. While I’m babysitting my neice I doubt I’ll get much knitting done still i started another suprize jacket (they seem to be an addiction so if you need a babyshower gift etc) I’m useing some wool i hand spun and pairing it with some merino alpaca blend I got when I lived in Saskatoon. 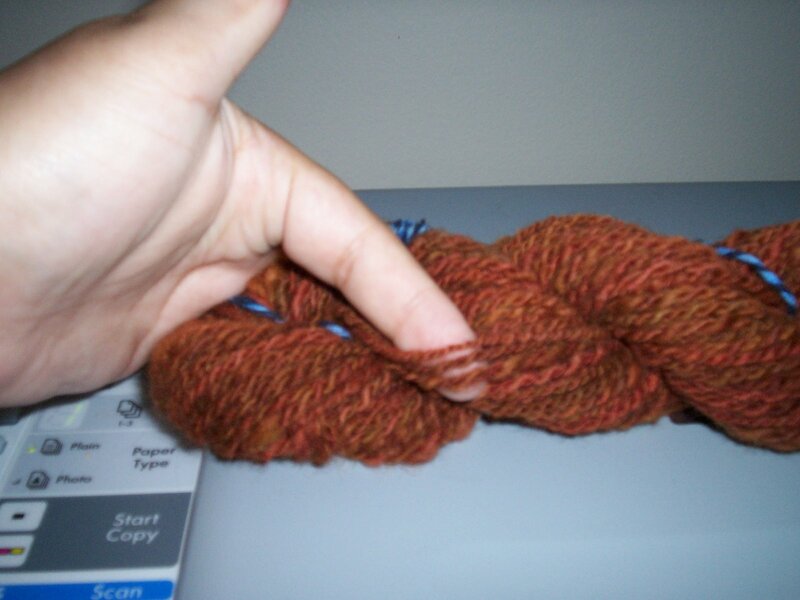 A few weeks ago I got some rovings (and subsiquently turned it into some yarn). 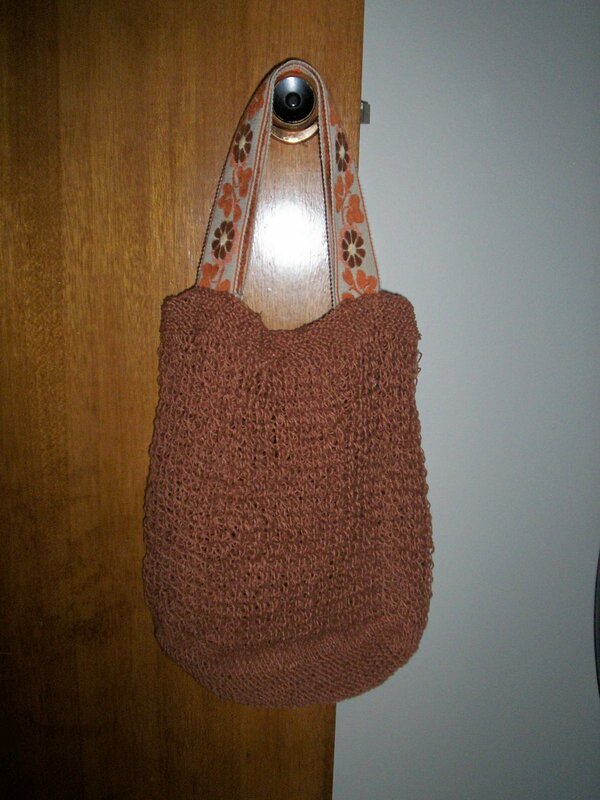 It’s a goregous red brown and is 100% romney wool. 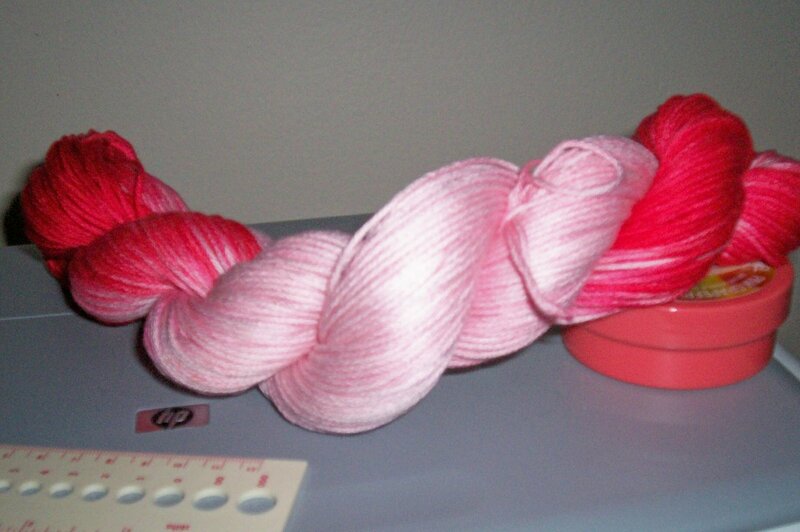 It’s my first try at plying yarn with yarn rather than with thread or floss. Also I started knitting a Phildar jacket for myself for autumn (i know a bit ahead of myself) with some ModaDea I picked up on clearance from Michaels a while back. And although I know I really should be finishing my tank top from NSFY (just needs the armbands and neck band) or working on my uncles siewash (started sleeve one) I really have this nasty case of startitis that just makes me want to start millions of things at once. Soon to come – Pictures of the finished baby suprise jacket with buttons.